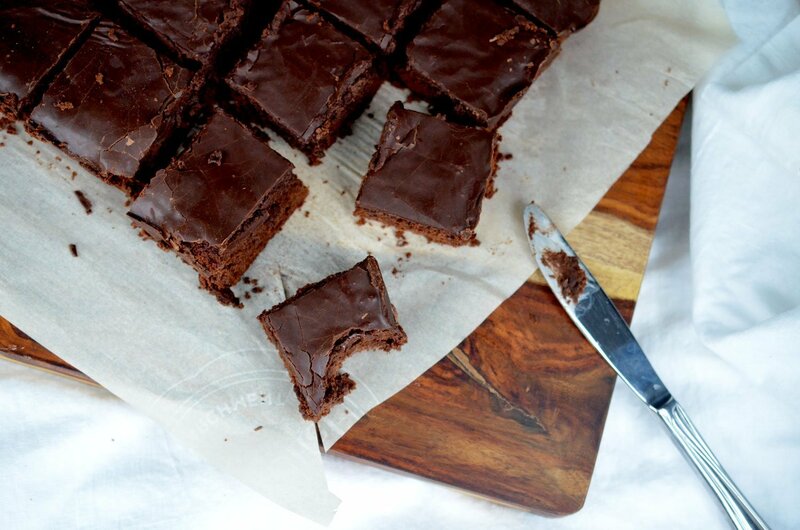 Brownies are a classic and absolute staple in any kitchen repertoire. This recipe is simple and delicious – just the way brownies should be. Expect them to be a hit with any age, children to adults, and to have everyone asking for seconds. Best served with whipped cream, ice cream or just on their own! Mix together the melted butter, sugar and cocoa. Beat in the eggs one at a time until the mixture is smooth. Mix in the flour until fully incorpoated. Pour into a grease or parchment-lined pan 9×13 inch pan. Evenly distribute the batter in the pan and bake for about 25-30 mins or until a toothpick inserted into the center of the brownies comes out clean. Set aside to cool. While the brownies are cooling, mix together the icing sugar, cocoa powder, butter and boiling water for the icing. Whisk together until smooth. Pour onto the brownies while they are still warm (but not hot). Let cool completely to room temperature. These brownies are absolutely phenomenal. I may be known to eat at least five in one sitting. A batch usually never lasts more then a few days. You’ll love them. I guarantee it.